TOFU MOM . . . and gravy! : Garlic Scapes = Spring! I finally accepted spring had arrived today, when I stopped by one of my favorite farm stands and they had garlic scapes!! Let me introduce you to garlic scapes!! They are basically thin, young, curling, tender, green garlic shoots. They have a much milder 'greener' flavor than regular heads of garlic and show up every spring in Western Washington farmer's markets and road-side-stands. If left unattended, the scape will grow larger and harden into the familiar opaque white/beige color of garlic peel. Keeping the shoot attached will also curtail further growth of the bulb. So, in an effort to allow the garlic to keep growing, the farmer cuts the 'scapes' or shoots - If you haven't tried them, you MUST! Try dicing it into scrambled tofu (OR eggs if that's your thing! ), adding to stir-fried veggies or as a garnish for rice or a creamy potato soup. My absolute favorite way to use garlic scapes though, is in pesto. The color is bright and green and the garlic flavor is fresh and light, not the strong, robust date-killing aroma that we all associate with garlic. (Don't get me wrong, I LOVE LOVE garlic in any shape or form or strength, but the mildness of garlic scapes is a refreshing change from the "regular" garlic that invades my kitchen!). Put sunflower seeds and cashews in food processor and whiz until very fine. Add tofu, lemon juice and olive oil and blend until smooth. This may take a while. Add garlic scapes, arugula and nutritional yeast and whiz until finely blended - it doesn't have to be a solid paste, but can be "chunkier" or grainy as you prefer... Add salt or pepper to taste if desired. 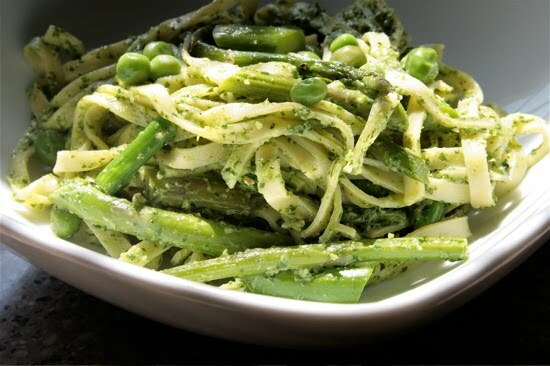 I tossed this pesto with fresh asparagus, peas and pasta for a TOTALLY yummy, locally grown, spring supper. Yum. Have a GREAT weekend! Garlic scapes are here? I'm with you, these are one of my favorite seasonal foods. That pesto looks wonderful! This looks delicious! I've always wanted to try those springy shoot vegetables- scapes, young red onion, baby leeks- but never gotten around to it. I must try your pesto. I always look forward to scapes. It's great to hear they've really started in one part of the country! Our Farmer's Market doesn't open until June, but I am going to look for the scapes at a few stands out of the area. You always come up with the most original, yummyest(is that a word? spell check doesn't think so) creations. I will be looking for scrapes at my farmers market.